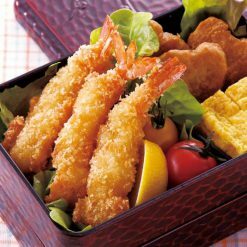 These fried shrimp are sized for bento boxes, and so are smaller than our Economical Fried Shrimp. Made with fresh, natural white shrimp. These shrimp are coated with batter at a rate of about 50%, and have a crunchy texture. They are also small in size, making them convenient for bento boxes or for late-night snacks. Preparing fried foods can be quite messy and time-consuming, and as a result many people avoid making their own at home. However, because this shrimp arrives ready to fry, it can save you a great deal of time and nearly all of the cleanup! In addition, because this shrimp is frozen, you don’t have to worry about it spoiling. Rather than needing to purchase shrimp a day or two before you plan to use it, you can purchase this shrimp now and use it anytime you wish within the next year! To fry: Without defrosting them, fry the shrimp in an ample quantity of oil (at about 170℃) for 2 to 3 minutes. Once fried, dip them in your favorite sauces and enjoy!Notes: Do not fry a large number of shrimp at the same time. If there is frost on the shrimp it can cause the hot oil to jump, so please be sure to remove any outer frost before frying.The cooking times listed are approximations. Please adjust according to the quantity of oil used and the efficiency of the cookware. 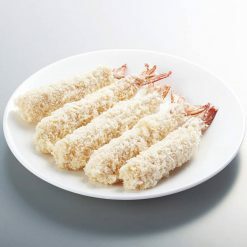 This product contains shrimp (white/Indonesia), coating (panko, wheat flour, sugar, table salt).. This product is not suitable for anyone with allergies to wheat or shrimp. Origin of ingredients: shrimp (Indonesia). Prepared and packaged in Japan.